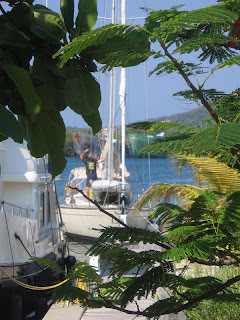 The next morning, after our terrific day with Eric and his family, we sailed the short distance around the corner to Roatan's West End and picked up a mooring. The idea was to shorten the distance we would need to sail to reach our next destination, Lighthouse Reef, off the coast of Belize, making it a long one-day sail instead of an overnight passage. 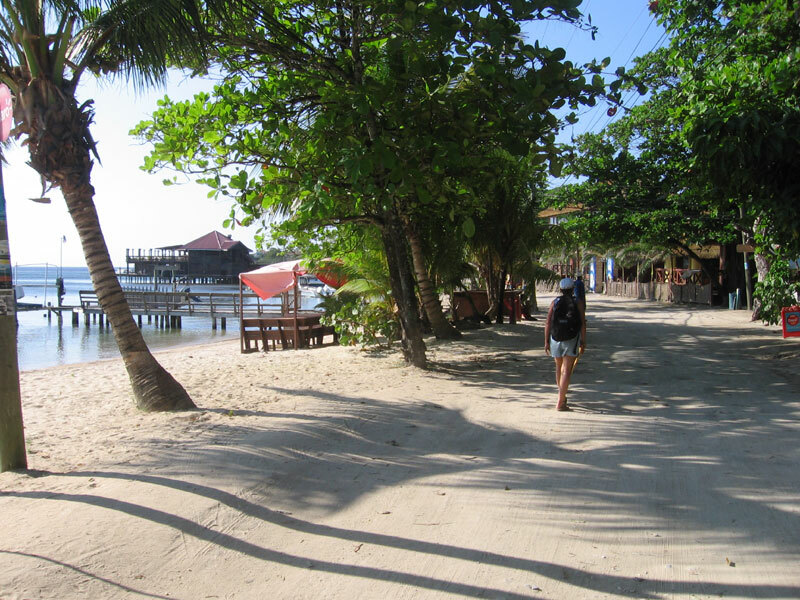 The West End is Roatan's original tourist area. The beaches are beautiful and the snorkeling is surprisingly good. 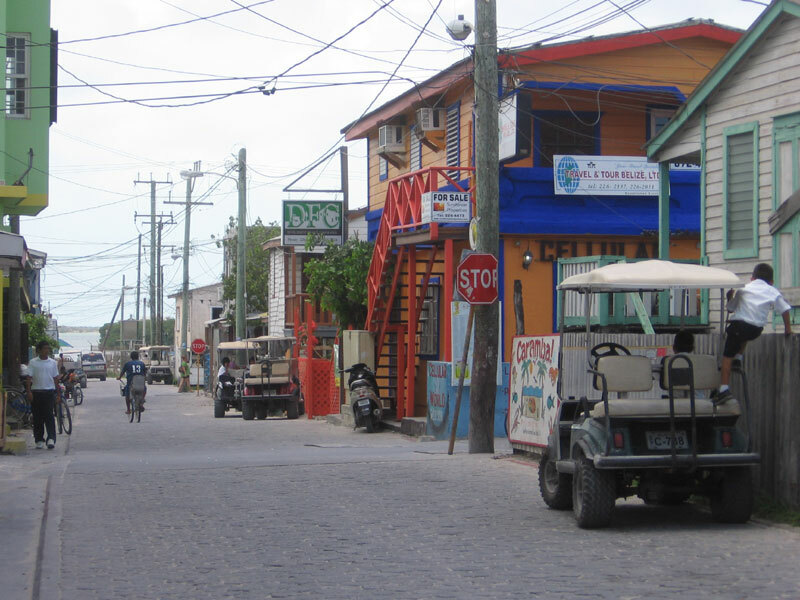 The still-unpaved road that runs parallel to the water is lined with funky shops and restaurants. 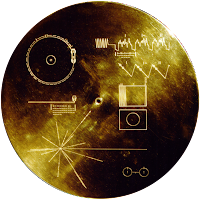 The area seems to be a magnet for "trustafarians" and Lonely Planet types. Capt. John and I drank beers at a beachfront bar while Nan and Jan explored, and then we all dinghied back out to the boat for sundowners and Capt. John's jambalaya. We were up at dawn the next day to take full advantage of the available daylight. The southern entrance into Lighthouse Reef is tricky and cannot be navigated safely at night. 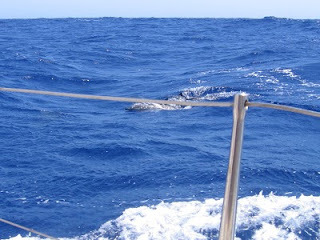 We made good time surfing a broad reach most of the day, accompanied by dolphins feeding on the fish fleeing our wake. Unfortunately, the late afternoon light and significant wave action when we arrived at the reef made it too difficult to exactly locate the entrance. We dropped anchor in shallow water outside the reef, with the idea of spending the night and trying again in the morning, but the holding ground was poor and the water too rough. Capt. John made the decision to press on for Ambergris Caye, off the coast of Belize, and we sailed on. So much for the Great Blue Hole. Maybe next time. We arrived at San Pedro on Ambergris Caye early the next morning. Unlike Lighthouse Reef, the entrance through the protective reef was well marked. 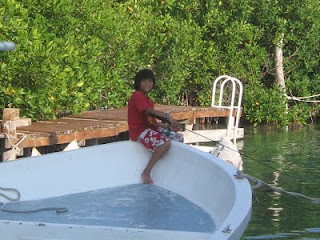 The water inside the reef was extremely shallow, so we ended up anchoring a few hundred yards offshore and dinghying in. 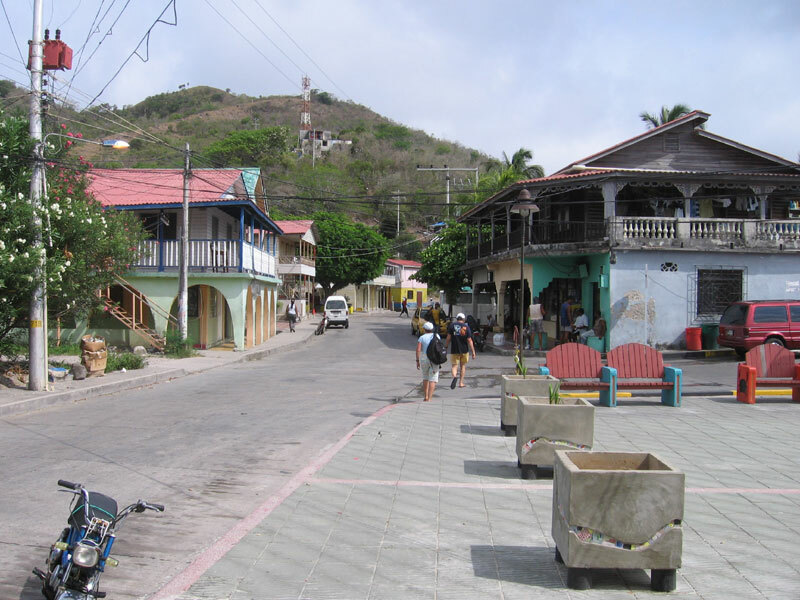 The first order of business was to clear in with Customs and Immigration, but we arrived before they were open, so Nan and I wandered up and down the main drag looking for an Internet café and a cheap hotel room for much-needed showers. We found both but returned to clear in with the crew first before going our separate ways. 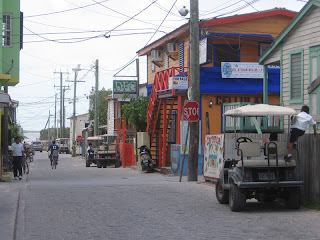 We regrouped for lunch at Elvi's Kitchen, probably the most famous restaurant on Ambergris Caye. The food was excellent, as was the Belikin, Belize's one and only local beer. After lunch, John and Capt. John spent time in an Internet café while Jan, Nan and I did some gift shopping. Belizean Arts Gallery and Toucan Gift Shop offered the best native arts and crafts we could find. We met up again late in the afternoon for a wet-bottomed dinghy ride back to where Quetzal was anchored and spent a quiet night on the boat in anticipation of another early departure the next day. 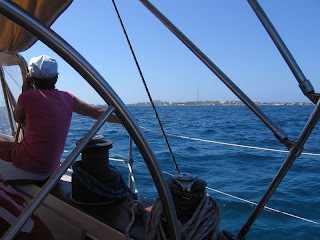 The final passage of our two-week trip was an overnight to Isla Mujeres, Mexico. Light winds on the second morning, as we passed Cozumel, prompted us to fly the spinnaker, but we doused all the sails as we approached the shallow water at Punta Sur, Isla Mujeres's southern point. Quetzal's old diesel engine, which had been giving us consistent trouble with overheating due to a worn-out heat exchanger, came close to calling it quits on the final stretch to Marina Paraiso, just south of the main downtown area. Capt. 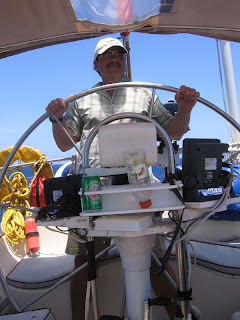 Doug Dorn, who met us in his dinghy to offer advice and assistance as we were approaching the marina, asked Capt. John why he didn't want to back into the slip instead of going in bow first. Capt. John told him that he was afraid the engine would give up for good if he shifted from forward to reverse; that's how close he thought it was. Nan and I like to get off a boat when the trip is over instead of staying on until it's time to fly home. 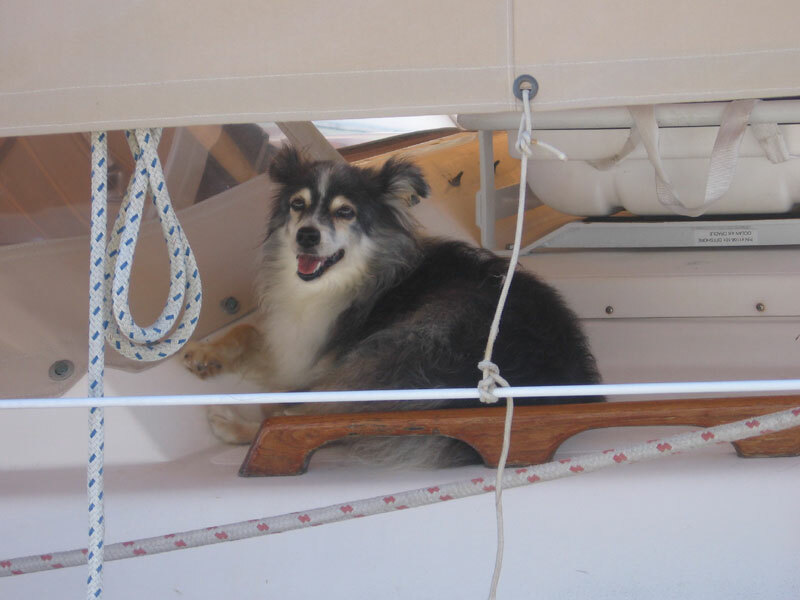 Mostly, it's a comfort thing: marinas are the hottest, buggiest, most humid places you could ever hope to stay. We had made reservations to stay at Color de Verano that night, in one of the new ground-floor studio units, so after we checked in with José in the marina office, we gave Louis, the owner, a call. He said he would open the unit for us, and I asked if he would also be willing to give us a ride there since he would be passing right by the marina on his way. He said he would pick us up in twenty minutes, so Nan and I hurriedly packed our duffel bags and made plans to meet the rest of the crew at Brisas Grill for dinner. Louis and his wife Teresa have done a wonderful job with their Color de Verano building at the corner of Rueda Medina and Mateos. Nan and I had stayed there three times before, once in the third-floor apartment and twice in the penthouse, most recently for a month last fall. While we were there that last time, the ground floor, which once housed a coffee shop, was being converted into two studio apartments. They turned out beautifully, with creative art-deco touches and one-of-a-kind fixtures. Louis put us in the unit closest to the building's lobby, and after seeing how nice it was, we wished that we had made the reservation for two nights instead of just one, but Nan had been able to use credit card reward points to get a free night at the Privilege Aluxes hotel across the street for the next night. As we walked down Rueda Medina toward Brisas Grill, who should we see but our Spanish tutor from last fall, Juan Torres. He has been impossible to reach since then, and he told us the reason was that his computer had died, so he had no email access. I asked if he would be interested in having me pay him to translate the cookbook I am writing in conjunction with Juan Gomez's family into Spanish. He said that he would be, but then he shrugged when I told him he would need a computer. On a whim, I offered to give him my laptop. His face lit up immediately. We still need to work out how to get it to him, and I will need to buy a replacement laptop, but having Juan involved with the project will make a huge difference. Entering Brisas Grill was like a homecoming. Our great friend Juan Gomez greeted us with hugs, as did Ventura, Irving and the owner, Weimar. There were big smiles all around but obvious disappointment that we were there for only two days. We took a table on the beach and ordered two of Ventura's special margaritas. Capt. 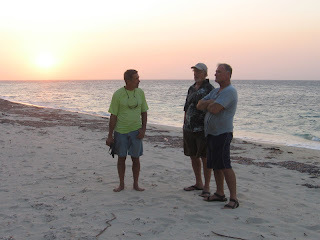 John, Jan and John joined us shortly and we all ate a fantastic dinner as the sun set on another day in paradise. We had an appointment with Louis for the next morning. 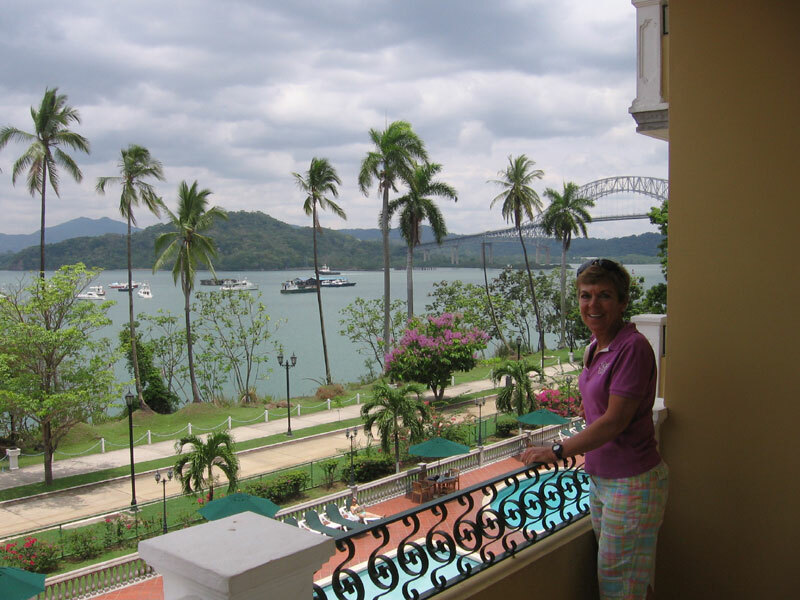 Back in January, when Nan and I were in Denver to celebrate her birthday, she had tossed out the idea of spending a year living in Isla Mujeres and renting Louis and Teresa's apartment overlooking Laguna Macax. We had looked at the apartment briefly during a previous visit when it was being built but had not seen it since its completion. Louis was more than happy to show it to us. He is rightly proud of the innovations he designs into everything he builds, whether it is a simple window or an elaborate chest of drawers. The apartment is located directly on the lagoon and has two levels, a main living area downstairs and a private rooftop deck with breezes and views upstairs. 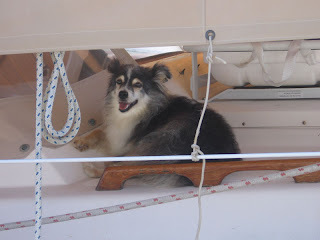 It would be perfect for us, and Louis said that our dog Scout would be more than welcome to join us. 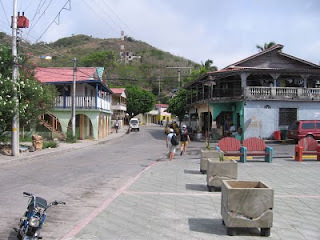 Nan and I returned to Brisas Grill for lunch and to make arrangements with Juan Gomez to stop by his house that evening with some gifts we had brought for his children. As we passed the beach across from Jax Bar and Grill on our way back to Color de Verano, we spotted Eloy, the old man who sells popcorn and chips on the beach, sitting on his adult tricycle with his basket full of snacks in the back. Last fall, we had noticed that he was in need of new shoes, so we promised we would get him some. We ran inside to get the new Reeboks we had brought for him and then ran out to the beach to give them to him. Eloy doesn't speak much English, but we could tell he was touched. We spent the rest of the afternoon moving across the street to the Privilege Aluxes hotel and reading on the beach. It was a relief to escape the unseasonable heat with a quick dip in the cool ocean. It made me wish we weren't leaving the next morning. We regrouped back in our room and then drove our rented golf cart down to Juan and Paula Gomez's home in the Salina Grande colonia. It was fun to spend time with the family and see the photos from their daughter Paulina's first communion. We talked briefly about the cookbook, and I told them about inviting Juan Torres to do the translation. They promised to take more photos of Paula's dishes and send them to me. I hope to have the book close to completion by the time Nan and I return for two weeks in September. We met the rest of the crew that night at the central plaza and walked up Hidalgo to find a restaurant for our final meal together. 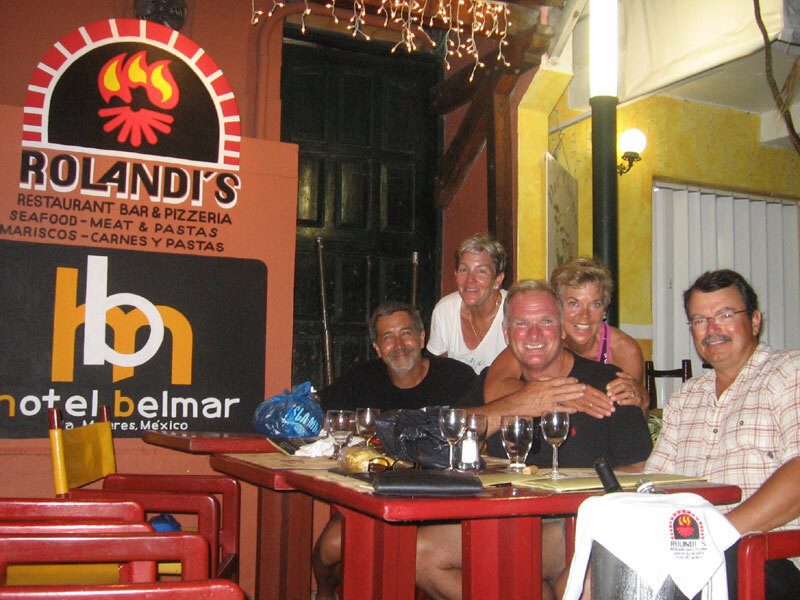 We agreed on Rolandi's, Isla Mujeres's most popular restaurant for Italian food, and ate another excellent meal. We all had flights to catch the next morning, so we called it an early night and said our good-byes. 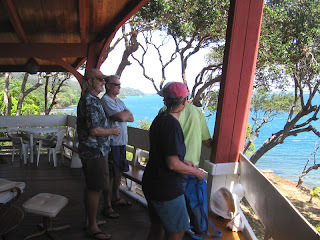 Our day on Roatan with Capt. John's friend Eric Anderson and his family was the highlight of the trip. We got off to a late start because Eric had a flat tire while driving over to pick us up at Barefoot Cay Marina from his home at the east end of the island. On the drive back to his house, he gave us a guided tour of Roatan and how it has developed since he first moved there more than thirty years ago. Eric was the Cessna Aircraft rep for South America in the '70s and flew small planes over Roatan frequently in his travels back and forth. From the air, it looked like paradise, so he convinced his family to purchase property there. To this day, they own a good portion of the east end of the island, including Port Royal Harbor on the south side, where Eric and his family live, and Camp Bay Beach on the north side, where Eric has a beach house. As he told us during our tour, he sees himself as the steward of his property, so he does what he can to control development on the parcels he sells off and is active in preserving the island's coconut palms, which are dying from a yellowing disease epidemic. When we arrived at Eric's home on Port Royal, we were greeted by his wife Sarita, his three-year-old son Axel and the family's two friendly Rottweilers. 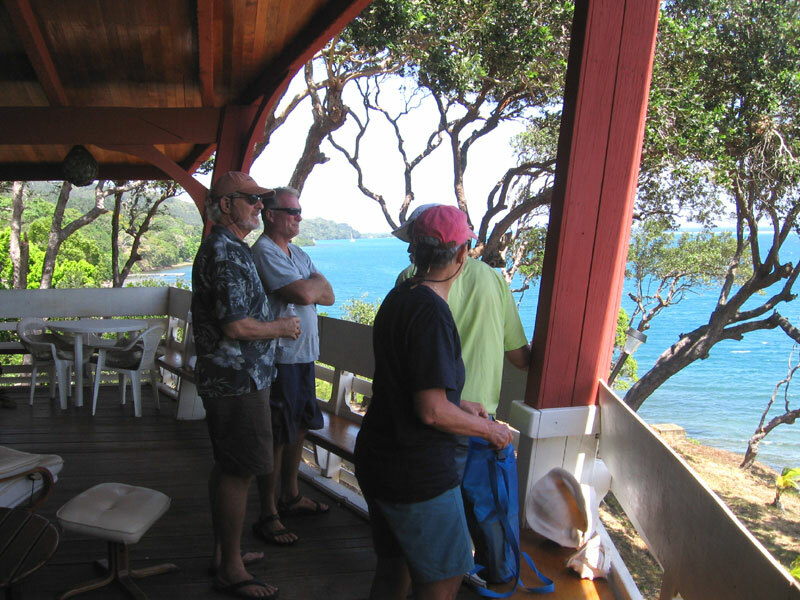 We admired the views, flipped through scrapbooks containing mementos from all the past boating visitors to Port Royal, and then walked down to the pier for a boat ride in Eric's skiff. He showed us the small island a little ways offshore where he had built a runway so he could fly directly to his home, the ruins of a failed marina that was also the scene of a bloody murder, and a maze of mangroves that could be negotiated as a shortcut around to the north side of the island. They're rare in the area, but Eric told us to keep an eye out for alligators. He had once rescued one that had been knocked unconscious by a fisherman. Sarita and Axel, who did not go on the boat ride, had a nice barbecue dinner waiting for us when we returned. After dinner, Eric suggested that we drive over to Camp Bay. Nan and I exchanged contact information with Sarita, said our good-byes to her and Axel, and promised to sail into their beautiful harbor someday. Camp Bay was a long, pristine stretch of beach, spoiled only by a profusion of plastic bottles brought ashore by the waves. Eric's beach house was nestled back in the palms, almost invisible from the beach, which was intentional, according to Eric. He said he doesn't understand the desire to build right out at the water's edge, detracting from an otherwise uninterrupted view up and down the beach. 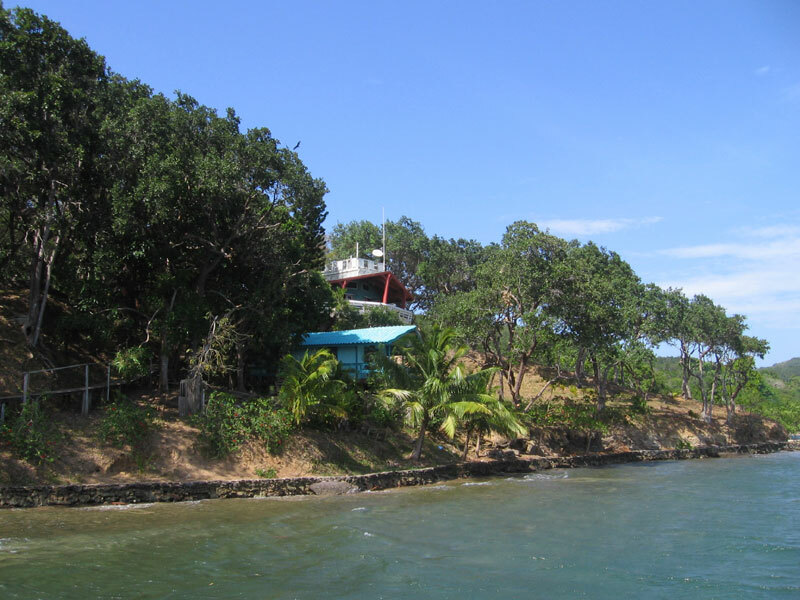 The beach house itself was a marvel, a spiral construction around a central courtyard, with compact buildings for life's functions--cooking and eating, sleeping and relaxing--in the four corners, connected by stairways, like a modern Swiss Family Robinson. Bats had taken up residence under every eave and were dropping their guano everywhere. It was dusk when we were leaving, and the bats were busy hunting biting insects, so it was probably a worthwhile trade-off. 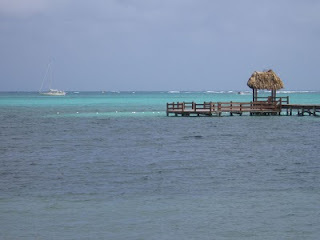 We are sitting poolside at the Barefoot Cay Marina in Roatan, one of the Bay Islands of Honduras, enjoying the cool breezes that propelled us here from points south. We arrived yesterday morning after four days and three nights of continuous sailing from Providencia, a small Colombian island off the coast of Nicaragua. Capt. John wasn't kidding when he said we would knock out a good portion of the total sailing distance in the first half of the trip. 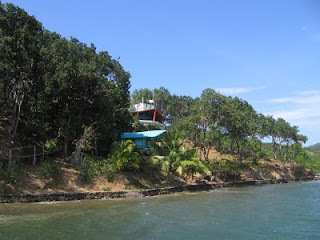 We departed the Careening Cay Marina in Bocas del Toro, Panama last Saturday and sailed three days and two nights to Providencia, stayed the night and then headed out again the following afternoon. 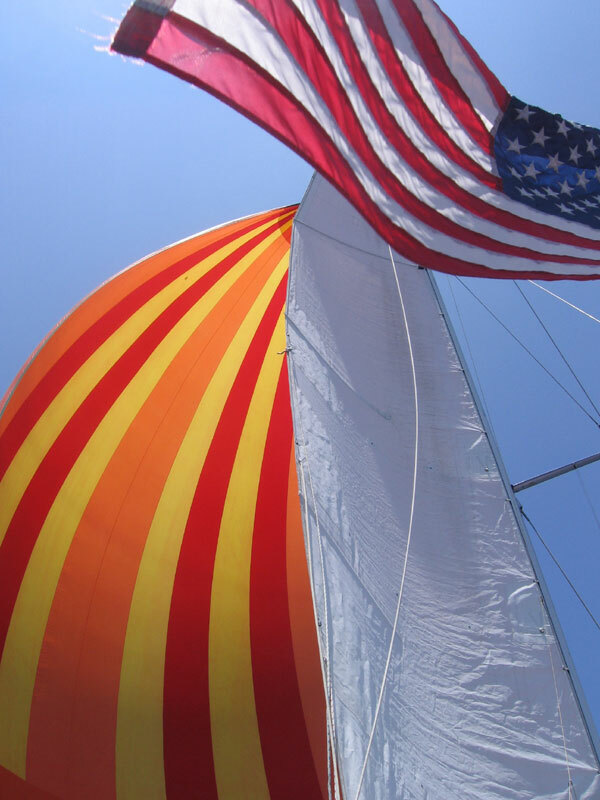 We have covered about six hundred miles so far in seven days, and a fair number of those miles have been motor sailing in light winds. 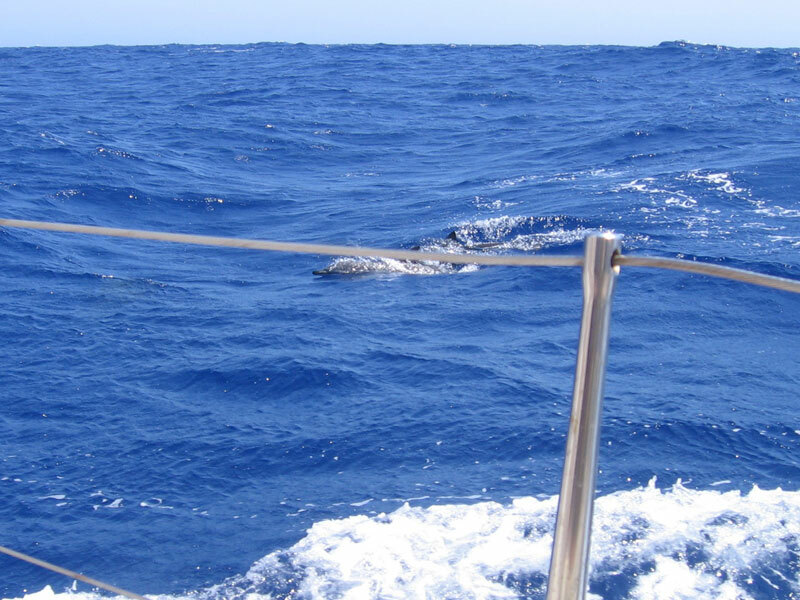 Our best sailing so far was on Friday evening, when we were zipping along at 8.5 knots or more in a broad reach with a fast northerly current. Backing up to the beginning, Nan and I had an uneventful trip from Colorado to Panama City, where we stayed at the Country Inn located at the Pacific end of the Panama Canal. The first photo shows Nan standing on our balcony, with the bridge over the Canal and boats from the Balboa Yacht Club behind her. 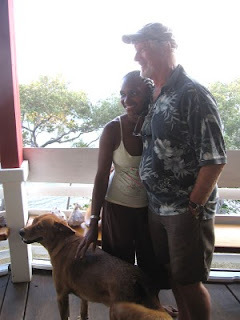 The next day, we flew over to Bocas del Toro and met up with Capt. 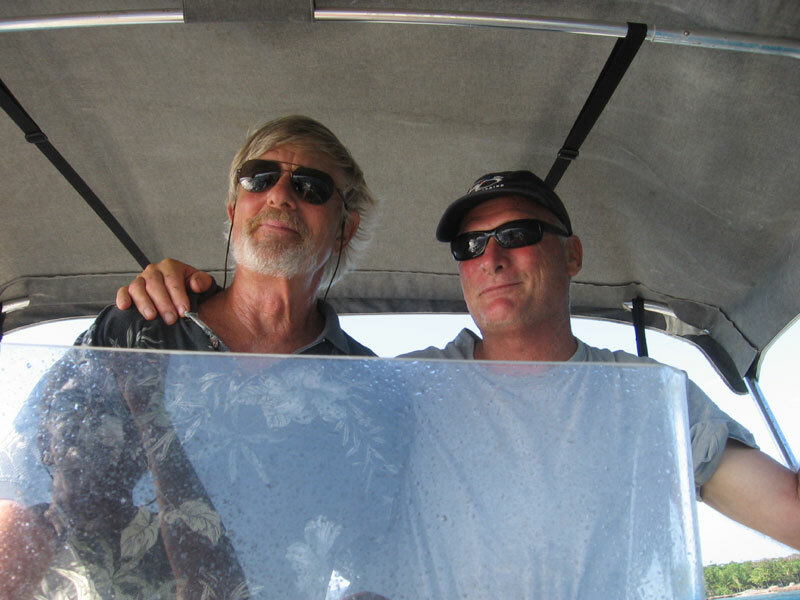 John and fellow crewmembers John and Jan on Quetzal at the Careening Cay Marina. Providencia was a bit of a let-down. The tiny island is parched from seven months with no rain, so there was no water available to refill our boat's tanks and no produce to be bought at the tiendas. Nan and I rented a scooter for the day and motored around the island, being careful not to add to the considerable iguana and black crab road-kill we saw. There were some nicely kept houses here and there, but the poverty was stark and the litter overwhelming. The island is not set up well for boat visitors; there were no facilities of any kind at the public dock, not even restrooms. We stayed pretty sweaty and grubby, except for quick boat showers, until we arrived here in Roatan. Today we are going to tour Roatan with Capt. John's friend Eric, who lives here with his wife Sarita and young son Axel. They are going to take us to some nice snorkeling spots and then we'll find a good spot for a picnic. 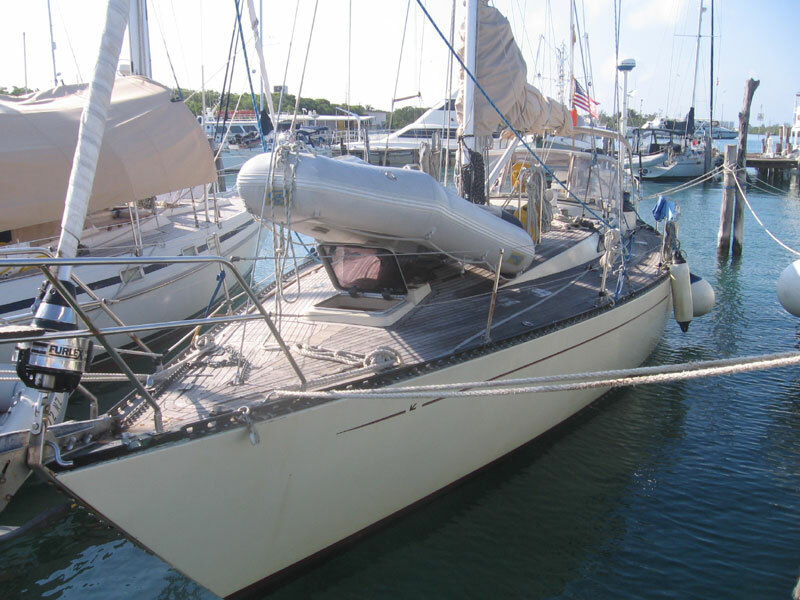 Tomorrow we will set sail for Lighthouse Reef in Belize. It should be a long one-day sail that will put us close to the Great Blue Hole. From there, we will do another day sail to Ambergris Cay in Belize and then an overnight sail to Isla Mujeres, arriving on Thursday afternoon.